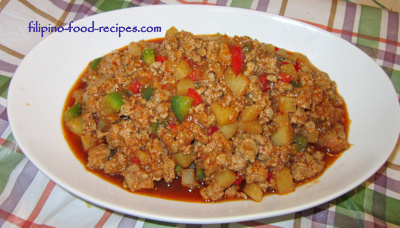 Giniling Guisado is sauteed ground pork cooked in tomato sauce with potatoes, carrots and bell peppers. It is also referred to as Picadillo, except that Picadillo is usually served with fried plantain or banana. Interestingly, this dish is called 'Torta' by my Kapampangan cousins, as it is also the base for the dish Tortang Gin iling. The ground meat is first marinated in soy sauce and calamansi or lemon juice before sauteing in garlic, onion and bell peppers. Others use tomatoes, instead of the tomato sauce. Also, some people put carrots, while others don't. If a dish calls for bell peppers, I mince or chop them with the garlic and onion and add in the saute. This is called Sofrito, a staple in Spanish/Latino saute. And then I reserve a few strips or cubes of the pepper and add them in the end to keep its vibrant color for an appetizing dish presentation. 1 Marinate the ground meat in soy sauce and lemon juice, set aside for 30 mins. up to 1 hour. 2 Saute garlic, onion and 2/3 of the bell peppers. Add the meat and cook until oil is coming out of the meat, about 6- 10 minutes. 3 Add the potatoes and carrots, and cook for another 5 minutes. 4 Mix in the tomato sauce and beef broth. Let simmer for 12 - 15 minutes. 5 Add a cup of water if it's drying out before the potatoes and carrots are cooked. 6 Mix in the remaining 1/3 bell peppers and season with salt and pepper. You could use ground beef or ground chicken for this recipe, too, or a combination of meats. If you are to use Knorr beef cube to season the dish, hold back the salt since adding more to the combination of the soy sauce and the Knorr cube could be make the dish inedibly salty. Left-overs could be made as meat filling for omelet in dishes like Tortang Talong and Tortang Giniling.